Fundamental information for impressionable business cards. Use your custom business cards to make your first impression count. Discover what consumers think about plastic business cards. Find out the answers to your specific business card questions. Understanding the fundamentals of custom business cards is essential for getting the most out of your plastic products. Question #1: What is a business card? It's the first impression of the individual and their company. This card contains your business's contact information while conveying the quality and expertise of your company. They are used to make a personal connection for future services with a potential client, customer, vendor or partner. Question #2: Why does a business need plastic business cards? With our busy lives and crowded inboxes, things get lost or forgotten easily. Leaving a plastic business card behind allows you to share your information, provides a secure foundation for future business and lets you stand out in a crowded market. Question #3: Types of business cards. Use appropriate verbal and non-verbal cues. Showcase your company with creative and original business signage. 72% of people judge a company by the quality of the person's business card. 9 out of 10 consumers said the quality of printed materials is an indication of the quality of service that the business provides. 87% of Americans still exchange business cards when they meet someone for the first time. 9 our of 10 consumers agree there will always be a need for printed marketing materials. 78% of people find color cards more memorable than plain white cards. A face-to-face request is 34 times more successful than an e-mail. Typical questions pertaining to custom business cards. What information should I put on my plastic business card? There's tons of information you can put on your custom business cards. All of it may seem important to you, but there is specific information that is essential to help you grow your network. Some core contact information to include on your plastic business cards are your name, logo and contact information. Only put your professional contact information onto your plastic card to prevent prospective clients from calling your personal phone. Put other information onto your business card if it is needed or relates to your company. Cards that are too busy, or have too much information are hard to read and will confuse potential clients. Can I order plastic business cards for multiple people? Yes, you can! In fact, we encourage it. The price per card is reduced as your order a larger quantity of cards and/or when more people order at one time. Do you have design tips for frosted or transparent business cards? Clear and frosted plastic business cards are one of our most buzz-worthy products. In order to achieve your aspired business card, there are a few things you should be aware of. When you are printing on a clear card, the ink will show through to the other side. If you are set on having information on both sides, you can use a frosted card or add a blocker to change the level of opaque or transparency on the card. We recommend using similar colors when using a blocker because using different colors has the potential to change how the color appears on the card. We do not recommend using white on both sides because there is nothing to mask the ink from showing through on the other side. Why should I buy a plastic business card over a paper business card? Plastic expresses a incredible sense of premium quality and creativity. 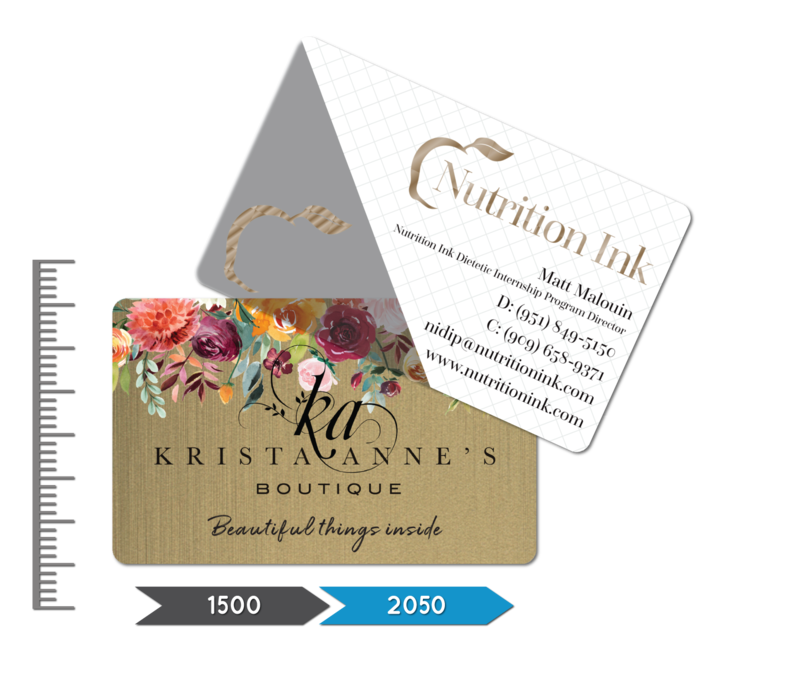 With a plastic card, you have the ability to customize your business card to your exact specifications by using clear accents, embossing, foil stamping, metallic finishes, custom shapes and so much more. As the marketplace is becoming smaller and more competitive, it is crucial to show your potential clients and partners that you are invested in them. Your business card is the first experience they have with your company. Custom business cards help you stand out among your competitors and convey the quality of business your company is going to give to this specific individual. What are the benefits of custom shape business cards? Custom shaped business cards get noticed! In a pile of rectangle business cards, custom shapes stand out and give your potential customers something to remember you by. The shape gives the customer a clear distinction of who you are and what your company is known for. Die cut cards deliver impressions that last! What is the most commonly asked for shape? We create business cards in thousands of custom shapes, but our square business cards are the most popular. 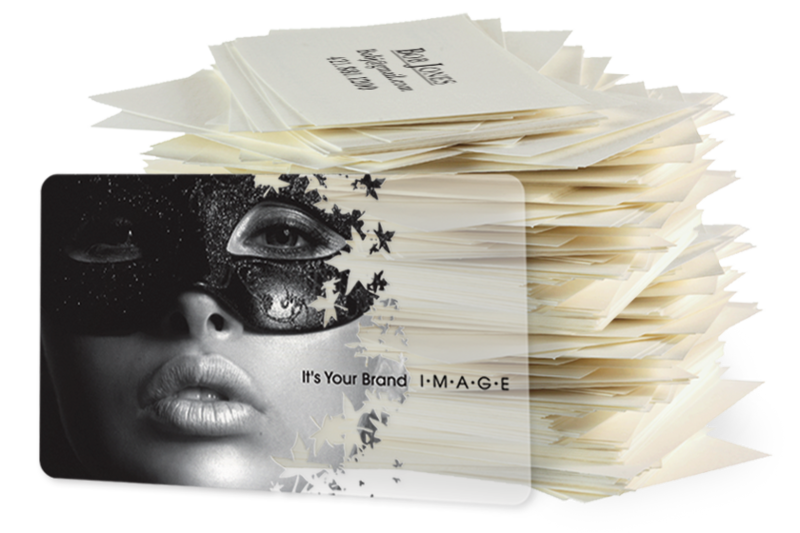 Join thousands of industry leaders and business professionals in setting the standard for custom business cards. Let's get started on your business card design today!